ASTRO, San Antonio, Texas · 2018, J. O. Thariat et al. To improve radiotherapy (RT) in terms of tumor response and to reduce irradiation of healthy tissues, innovative therapeutic approaches are needed. In response, NBTXR3, injectable hafnium oxide nanoparticles, was developed for the treatment of solid tumors. Once injected intratumorally, NBTXR3 can deposit high energy within tumors only when activated by an ionizing radiation source, like current standard RTs. Upon activation, the high energy radiation physically kills the tumor cells by triggering DNA damage and cell destruction improving clinical outcomes. 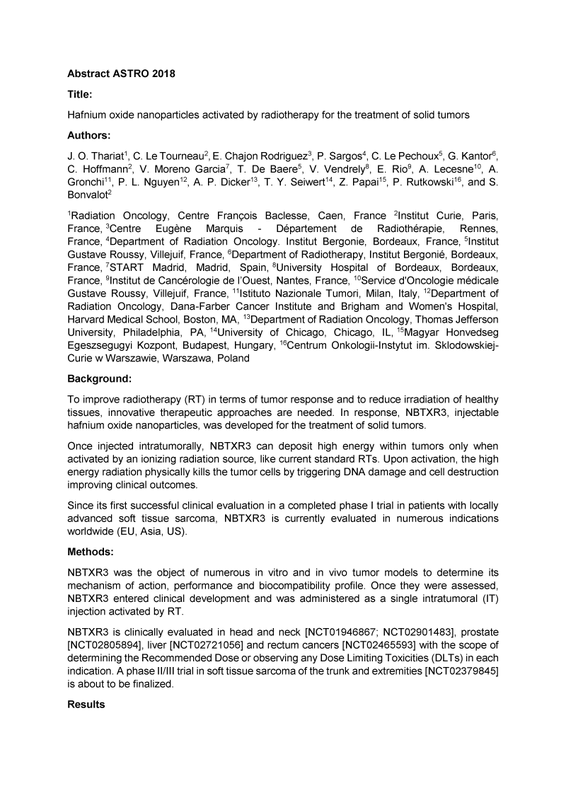 Since its first successful clinical evaluation in a completed phase I trial in patients with locally advanced soft tissue sarcoma, NBTXR3 is currently evaluated in numerous indications worldwide (EU, Asia, US). NBTXR3 have shown promising results in non-clinical studies with marked antitumor efficacy and in clinical development in terms of safety and preliminary evaluations of efficacy. Considering the preliminary results of the 145 patients injected across all clinical trials, these first-in-class nanoparticles have already proven to be an encouraging innovative treatment in various types of tumors. The last patient of the phase II/III trial in STS was included and the results of this study regarding efficacy and safety will soon be disclosed.